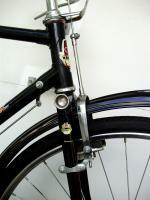 Bicycle Repair Forums - BikeRide › Maintenance & Repair › Frame & Forks › How do you measure this bike for frame size? 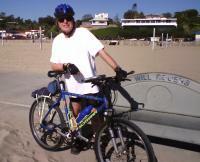 It is a mans bike, aluminum frame, with 700c Wheels? Is it still from the top of the seat tube down to the center of the crank? (04-16-2015, 12:58 AM)elmore leonard Wrote: How do you measure this bike for frame size? There is no iron clad rule for size measurement of a frame. There are however some commonality's that exist from maker to maker. Some use cm, some use in. , an others simply xsmall, small, med, large.etc etc.. most all are taken from the center of the Bottom bracket and straight up the seatube to a point designated by each manufacturer. This point is where things change a bit. Some are measured to the center of the top tube, some the top of the top tube, some the top of the seat tube frame styles can influence this point of measure, such as a girls frame or a frame with a sloping top tube or a frame in which the rear stays are above the top tube. In any event you would be close to with a gents frame to measure from the top of the top tube to the top of the seat tube split the difference and be close enough for all practical purpose. For the step thru o lay frame go to the top of the seat tube. Road bikes mostly go by cm. and all others by in.. But again no iron clad rule to that either. If you can find documents from the maker, it will show you how they have measured the bikes they make. I often wonder why the bike frame size is not stamped on the top of the cross bar for buyers and sellers to see. It would be easy to do. This Raleigh bike measures 16" from the bottom bracket to the top of the seat tube. Boy do not know why we have three empty repeat messages, perhaps the blackberry is not as good for posting as a computer, operator error. Anyway there ere a lot of creative frame designs. However the standard measurement used to be top of top tube at seat tube to the center of the crank, or top of seat tube to center of crank, which would apply here. That worked well for triangular frames.